It has been my fortune, or misfortune, whichever you wish to term it, to have traveled a good deal and to have observed not a little. I have engaged in more than one business; it pleased my fancy, and can say, with a pardonable pride, that I have met with some degree of success. During the past few years of my life I have studied human nature in all its phases, from its lowest forms in the gutter, in the slums, in the gilded dens of vice, in the gambling rooms, in society and in all other walks of life. In fact I have "taken observations" all along the line so to speak. I have watched the methods employed in running many a successful business and have gleaned a great deal of useful knowledge from successful business and professional men. This knowledge and these facts I have put together to the best of my ability. They have been and are useful to me. Why should they not be useful to others? For the benefit of those whose knowledge is limited and who desire to know of the ways of the world, I believe this volume will be of great value. The only other object I have in publishing it is to gather in the great American dollar--which we are all after and which is so hard to corral and so easy to get rid of. 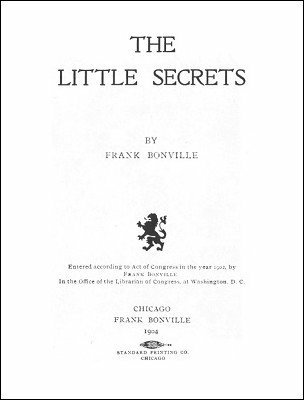 1st edition 1904, PDF 29 pages.